Dynamic ads are currently in open beta testing. To generate dynamic ads you can use the entire feed or apply filters to choose individual products. On the ad group editing page, click +New filter and add up to 50 filters connected by the conjunction “OR”. Selection rules determine which products are used or excluded when generating dynamic ads. All products are grouped by some attributes (category, price etc.). These attributes depend on the feed type. For this type, attributes are displayed in a tree view or condition list. 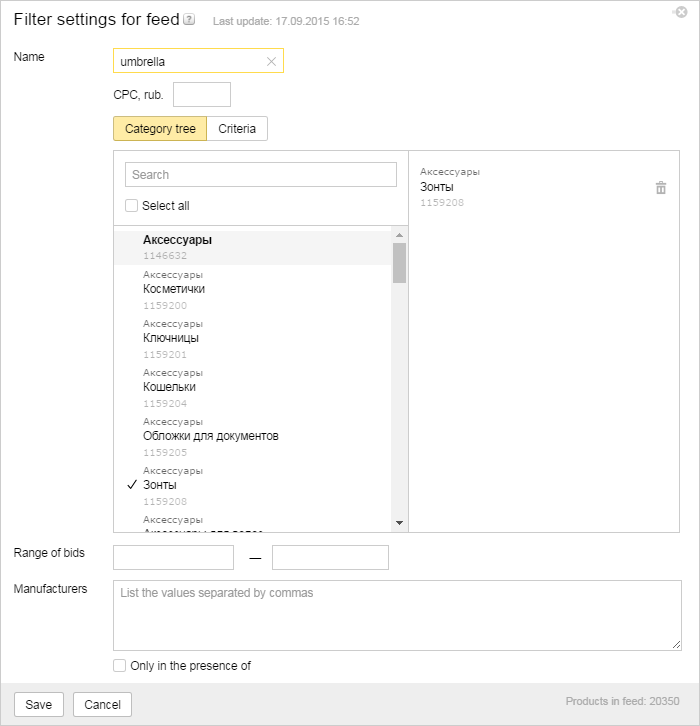 Yandex recommends that advertisers who have just started working with feeds use the Category tree. You can also specify a range of product prices and vendors, or only select products that are in stock. The category tree is updated once per day during the repeat automatic validation of the feed. You can specify up to 10 criteria connected by the“And” operator. In a single criterion, you can add several ranges connected by the “OR”operator. To do this, click . When you select a range, the system will select product offerings with parameters that fall within the specified range of values. When you select the operators contains/does not contain the system will pick the pages where the sequence of characters can be found with the specified spelling (not case sensitive). You can select all product offerings from a feed with the Select all button. You can use all your product offers from a feed to generate ads. If you employ a strategy with manual bid management, then you can set the CPC in the filter settings.